This year (2017) we visited Anza Borrego State Park, located in the Colorado Desert of California (is that like the Los Angeles Angels of Anaheim?). We were there at the beginning of April. You can see photos of that trip here. Last year (2016) we visited Death Valley, located in the Mojave Desert, in early March and were fortunate to see the desert floor awash in Desert Gold wildflowers. This was my first trip to Death Valley. The timing couldn’t have been any better. It takes just the right amount of water, at just the right time to create just the right conditions for a desert super bloom. The last one happened in 2005. With climate change and recurring drought, there’s no telling when the next one might occur. Among the flowers, our golden-haired dog Jackson felt right at home. So did his canine cousin, a visibly pregnant coyote who paused next to a small smattering of purple flowers to check us out and let us take her picture. Ok, I might have missed the peak of the bloom by a week or two. We spent the first weekend of April in Anza Borrego, a state park in eastern San Diego County. It’s hard to time these things just so. No matter! The desert was at it’s most beautiful and colorful this spring. The perfect timing for desert wildflower blooms is hard to pin down. The seeds of some plants can remain dormant for years and then when the just right amount of rain happens (after six years of drought in California, for example), at just the right time, with just the right amount of sunny and warm days after (but not too hot too early! ), some of these dormant seeds that have been patiently waiting spring into germination and the normally sandy, rocky and dun colored desert landscape erupts into color. Other long-lived plants, like Prickly Pear Cactus and Ocotillo, also take advantage of the additional moisture and push out their own blooms to rival the annual wildflowers. Pollinators like insects, birds and bats feast on nectar and help to pave the way for a new generation of seeds which may have to wait for our next perfectly wet winter… Will it be next year? We’ll have to wait and see. What happened to the original Super Bloom post (2016, Death Valley edition)? I realized I never posted the photos! Now that’s done and you can find the link here. I’ve lived here most of my life and have never had a chance to get to the Wistaria Festival in Sierra Madre – until today! It only happens one day each year. The single plant, which is more than 100 years old, is on private property (it actually spans two properties), and the owners generously let the public in to view the vine every year in March, when it is at its peak bloom. The plant engulfed the original house it was planted near and eventually caused it to collapse (it was demolished in the 30s). The house had already been abandoned to the vine by that time and the owners had built a new house a couple of hundred feet away. Now the vine is supported with a network of posts and pipes that help to give it some structure. It is listed by the Guinness Book of World Records as “The World’s Largest Blossoming Plant” and it is estimated to weigh 250 tons. Here are a handful of photos, but there is no way to capture the magnitude of the Wistaria in a picture or a hundred pictures. It’s massive and grand. The other thing that can’t be captured in photos is the lovely fragrance. For that, you have to pay a visit yourself – March, 2017 will be your next opportunity. * Yes, that’s how they spell it. From the anonymous, rogue artists that brought the Griffith Park Tea House to L.A. last summer, Petal Drop happened today in a tiny alley off of Broadway. When we arrived close to dawn, the city was still quiet. Aside from sleeping homeless people wrapped in blankets and nestled in doorways, the sidewalks were mostly empty along the few blocks we walked to reach the metal door. As the daylight intensified, so did the hustle and bustle of the street, a crowd began to gather, a stream of city buses passed by, rattling shopping carts with staticky, blaring radios were pushed along. The line that formed was a bit of a fashion parade with cute, small dogs being one of the most popular accessories on display. We waited in line for a while (with our own dog, too large to carry, at the end of a leash) for our chance to enter the alley . The mood was upbeat and friendly There was a sense of exception and mystery. People introduced themselves and made small talk while the dogs sniffed each other, their own version of small talk. Eventually it was our turn to enter the alley, in groups of about a dozen (we took turns while one of us waited outside with the dog). In a skinny, leftover gap between two buildings, not much wider than the door you entered through, a confetti of rose and cherry petals wafted down from above, swirling through the diffused natural light from the gauzy, white sky overhead, an open sliver between the rooflines four stories high. It was instantly peaceful and quiet, the familiar noises of the city street just a few yards away drowned out by the soft clicking of petals hitting various surfaces and a typewriter tapping from a fire escape landing above. No one spoke above a whisper. An element of theater, a few mute workers going about the business of alley, transported us to another world as if stepping into a play in progress. Visitors were handed small clipboards and asked to write their memories of Los Angeles, which would then be filed away for safe keeping. After 10 minutes or so, a soft bell encouraged us to leave the alley to make room for the next set of visitors. We arrived back on the sidewalk with a few petals scattered in our hair as mementos of the experience. The softness, lightness and pink-ness of the flower petals was a contrast to the hard materials that form the building blocks of the urban environment. But those materials are natural, too: metal mined from far underground and forged with intense heat; brick and concrete made of sand, cement, clay and water, also dug and scooped from the earth itself. We manipulate these basic elements to create the rigid world we live in and feel like we are in control. Then we pine for a sense of nature that is untouched by human hands, that is beyond our control and that can surprise us and make us feel small again. But we are not separate from nature, we are nature (which reminds me of my favorite billboard, “you are not IN traffic, you ARE traffic”). In one of the largest cities in the world, art has the ability to transform a “worthless” space into a sublime and transcendent experience shared by former strangers who are now connected by this event. It is a genuine gift by a collective of artists who love Los Angeles and generously share their vision, ideas, resources and time with us, accepting no credit for their work and expecting no compensation for what they provide. Tomorrow, the alley will go back to its normal state, hidden from view, empty, vacant and soon forgotten. Today, it was a special place that brought people together to enjoy a few moments of peace and beauty. Hopefully the “(01)” in the title of the project means we can look forward to version (02), yet to come…. 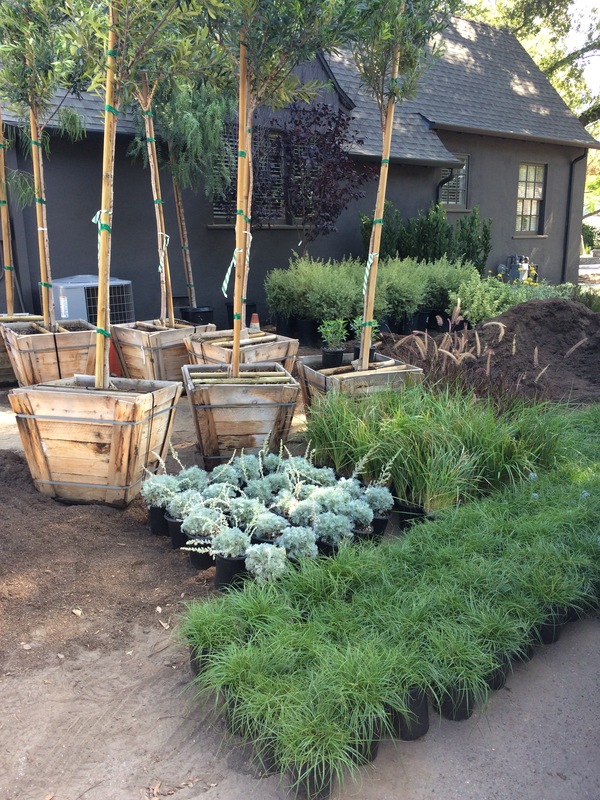 A client of Echo Landscape Design was interviewed recently on NPR about the effects of the drought and lawn removal programs on our city’s trees. She’s in good company! Don Hodel (a tree expert in L.A.) and Aaron Thomas (with North East Trees) are also part of the interview. Sadly, it’s been reported that 14,000 trees in the City of L.A.’s parks have been lost within the last year due to the drought conditions. It’s true that Julie removed a couple of trees from her front yard in preparation for redoing her landscaping to make it more drought-tolerant. She still has an enormous oak tree, three big Chinese elms and a couple of smaller trees on her large corner property. Getting rid of the lawn is one of the best things you can do for the majestic oak tree. The new planting scheme is full of large clumping grasses and flowering shrubs that provide shelter and forage to a wide array of wildlife, including butterflies, bees and hummingbirds – something the old lawn did not do at all – and that use far less water. And those two trees that were removed have been replaced with 16 new trees on the property! It’s definitely a net gain for the urban forest. The new trees will need irrigation to get them established. In return, they’ll provide shade (which helps lower energy usage and carbon emissions), help clean the air by absorbing pollution and carbon dioxide and also help to keep water in the ground during storm events, rather than letting it run off into the storm drain system where it is lost to the ocean.